You may be wondering, what on earth is Vibrational Medicine? Simply put, Vibrational Medicine is a collection of modalities and products that help one improve health & wellness through natural means. Even in our fast paced world of advanced technology more and more people are turning back to nature for improved health and wellness. Perhaps Dr. Richard Gerber defines vibrational medicine best as “an evolving viewpoint of health and illness that takes into account the many forms and frequencies of vibrating energy (like atoms) that contribute to the multidimensional human energy system,”. Vibrational Medicine is a collection of wellness practices and modalities that draws upon the living energies within objects, such as crystals, plants, bodies and food. The more well known forms of Vibrational Medicine include acupuncture, homeopathy, energy healing, chromotherapy, chakra therapy & sound therapy. Crystals by nature are highly vibrating energy forms and truly gifts from Mother Earth. The vast array of highly vibrating Crystals provide us with a large and varied selection of condensed and beautiful energy sources to tap into. One’s bioenergy field responds to the condensed energies within crystals to create an energetic healing effect. Plus, crystals are just beautiful to our senses! Crystal therapy helps us release energetic blocks, improves our meditative intention and can bring more balance into our lives. Before you dismiss the use of crystals and the effectiveness of Vibrational Medicine Practices, consider that crystals are used to power many modern inventions such as computers, radios, laser and even credit cards! The varied use of crystals is a testament to their incredible ability to store and conduct energy and information. Nikola Tesla himself referred to crystals as “living beings”. Renowned Cardiologist Dr. Stephen Sinatra with over three decades in practice concludes, “All beings are conglomerations of electromagnetic energy. In essence, our bodies function—for better or for worse—as dynamic electrical circuits. Cells transmit and receive energy, and each has its own range of frequency within which it operates. Healthy cells, for instance, oscillate at higher frequencies than do unhealthy cells, such as cancer cells”. If you have ever had your mood lifted through a good song, you have already enjoyed Vibrational Medicine at work! In the sections below, we’ve put together some helpful information about Sound Healing, Energy Healing, and the benefits of Massage Therapy and Hypnotherapy. It’s incredible and fascinating! We invite you to come stop by and not just learn about but experience sound and energy healing as a means to enjoy a holistic approach to improving happiness, health and wellness! Not very often in history does cutting edge neuroscience intersect with a practice that is thousands of years old. Yet, that is exactly the case with Sound Healing! Neuroscience is now demonstrating that chanting and vibrations have a direct impact on the human body, nervous system and brain. But how can sound help YOU? If you have ever felt better after listening to a song or attending a concert you have already experienced Sound Healing and Vibrational Medicine at work! Professional Sound Therapists take this natural phenomenon, along with ancient wisdom and modern research, and concentrate the sound waves in specific ways to provide the most optimum healing environment for your bodymind. In his book The Power of Sound, Joshua Leeds defines Sound Healing as “creating a frequency and vibration for someone that’s conducive for him or her to heal.” Joshua Leeds is an expert in the field of psychoacoustics, the study of the effects of sound on the human nervous system. Sound Healing is becoming more mainstream. Perhaps it is best compared to where yoga was 15 years ago. There is a collective realization occurring that sound is an effective medium to relieve stress, improve personal performance and treat illness. Specifically it is gaining more popularity as an impressive, results proven modality for working with autistic children. Expert in the field of psychoacoustics, the study of the effects of sound on the nervous system. Gerald Oster a research of biophysicist demonstrated that when a tone is played in one ear and a slightly different tone is played in the other ear, the difference causes the brain to create a third, internal tone, called a binaural beat. The theory is that this syncs the brain waves in both hemispheres, a process dubbed “brainwave entrainment,” the result being a brain in more synchronicity. This, in turn, creates more more focus and balance. By working with the brain’s natural brain waves, therapies are developed to tap into the natural healing ability within each of us. In 2008, the journal Alternative Therapies in Health and Medicine published a review of 20 studies of brainwave entrainment and patient outcomes. The conclusion was that brainwave entrainment is an effective tool to use on cognitive functioning deficits, stress, pain, headaches, and premenstrual syndrome. The studies also suggest that sound work can help with behavioral problems. As is witnessed in hypnosis, the different brainwave patterns affect emotions and allow for perspective shifts and emotional releases. Frequencies ranging from 500 to 400 hertz (a hertz is one cycle per second), are in essence a massage for your cells within your muscles, joints and bones. This vibrational massage filters throughout your entire physical and energetic bodymind. The principle of harmonic resonance elevate the body’s cells to a superhealing state, rebuilding more tissue and activating the body’s natural ability to heal itself. All our spa services include an element of sound wave healing treatment. Interested in a complete sound wave healing experience? Try our Sound Wave Attunement treatment! If Energy Healing sounds a bit to “woo woo” for you, we understand! After all how do you treat something you can’t actually see? In our modern times some of the first practitioners to notice the subtle energies of the body where chiropractors. Working with energy, however, dates back to thousands of years across many cultures. Energetic Healing is an umbrella term for any therapy that impacts the energy circuits in our physical or subtle energy bodies to regain balance and facilitate our body’s innate healing mechanisms. The more popular therapies that rely on the body’s subtle energies are Reflexology, Kinesiology, Chiropractic, and Acupuncture. However, Energy Healing also includes Aura and Chakra balancing, Flower and Vibrational Essences, Essential Oils, Crystal Healing, Colour Therapy, Spiritual Healing, and other forms of bodywork. Energetic healing allows the practitioner to take a holistic approach to collaborate towards total mindbody wellness and balance. In involves looking beyond simply the physical and working with the subtle energy systems (meridians, auric bodies, chakras, nadis) where the cause of the disease can be located within the body. Personal trauma, emotional stuffing, environmental and mental stress, false belief systems and physical discomfort create blocks to our personal growth and wellbeing. These energetic memories are stored in the energy fields and cells of our bodies, impacting our ability to function at our full potential. One 2013 study found that 10 minutes of energy healing was as effective as physical therapy in improving the range of motion in people with mobility problems! UCLA even has an electromyography (EMG) lab that studies electrical activity in the body. Energetic techniques facilitates the body’s natural healing process by clearing blocks in the energy fields, repairing and rebalancing the energy so that the body can achieve its optimal level of balance. Learning to work with the chakra’s and subtle energies within the body create a new way to receive information from the intelligence within each of our cells. By working with the energy system we can access all levels of the mind, bodymind and spirit and achieve a holistic sense of wellbeing. Energy is around and within us. Using focused consciousness enables us to activate it and make it vital. We invite you to come experience your subtle energy body change today. Click here to view our Energy Spa Treatments. Massage has gained mainstream acceptance as a proven and trusted modality to help with everything from relieving stress to improving chronic conditions. The Om Shoppe is innovating as we combine Massage with Sound Therapy and Energy Healing. Massage is a collection of techniques that manipulate the soft tissues and muscles to relieve tension and stress ultimately improving comfort and range of motion. Beyond the benefits for specific conditions or diseases, massage also provides energetic and emotional rebalancing. 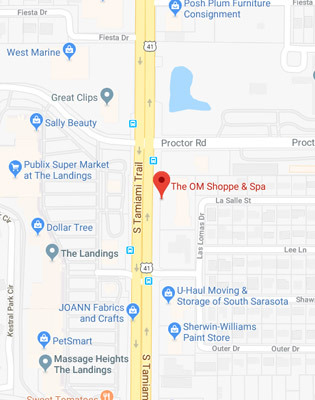 The Om Shoppe Massages are simply some of the best in the world. Discover the long lasting benefits of massage and The Om Advantages today. Click to explore our Massage Treatments. All hypnosis is actually self-hypnosis, and is a natural state that you actually enter into many times a day. Have you ever arrived at a destination only to realize you barely remember that stretch of highway that helped you arrive? When your grade school teacher said, “Stop daydreaming,” that was your bodymind connecting through natural & spontaneous hypnosis. Hypnotherapy and mindfulness coaching is simple, safe and successful. Our Certified Clinical Hypnotherapists possess specialized training and experience. Our highly trained professionals have completed comprehensive State Licensed training and participate in annual continuing educations. Together with your Hypnotherapist you harness the power of your deep inner mind to cultivate the life you desire. Our approach is personalized to your goals & aspirations. When you decide you are ready for change in your life, we begin by looking at your limiting beliefs and removing blocks. You are unique and your sessions will also be unique and based on what we discover together during our complimentary consultation. Habits can easily fall away within 21-28 days, and with hypnotherapy these are often everlasting changes. We encourage you to dream big! Through mindfulness coaching and hypnotherapy, you are forever empowered to take what you learn and practice it the rest of your life. Our goal will be to empower you as quickly as possible so that you can become your own hypnotherapist. Your unique, customized approach will draw upon our compassion, experience and extensive training. If you are struggling with a chronic condition or are simply seeking more inner peace and joy then Hypnotherapy is a smart, safe choice. Whatever it is you are ready to change, Hypnotherapy and working with your subconscious mind can help create the success you are seeking. *Prescriptions and referrals are required for working on diagnosed conditions. Click to view our Hypnosis & Hypnotherapy Services. Our staff therapists are certified Clinical & Transpersonal Hypnotherapist and not physicians. Please ask your practitioner for a referral prescription for any diagnosed or medical condition. Hypnotherapy is a collaborative partnership between the client & hypnotherapist and intended to create a safe and secure environment where the subconscious mind is affected by suggestion and reprogramming. All hypnotherapy performed is non-therapeutic and in no way intended to replace professional medical or psychological care. If you are under the care of a physician or practitioner of the healing arts, please obtain a referral prescription from your provider prior to entering into hypnotherapy. It is our honor to work with you in this sacred and powerful modality. We are positive we can truly create the change you seek.